Tiffany combined a fun animal theme and my current favorite rainbow theme for this cute Noah's Ark themed party. I love the animal balloons that she used to greet her guests. She got the idea from Martha and you can check out the tutorial HERE. You can check out the rest of this cute Noah's Ark party over on That Village House. Those balloon animals are super cute! I think I could even do this project! 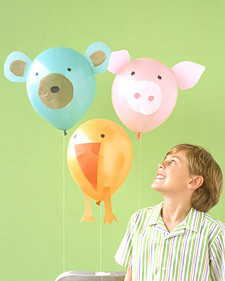 My two year is crazy for both balloons and animals so I know he would love these!